Scrambling opens up new challenges in spectacular and wild settings. Leave behind the beaten track as we follow daring routes up the ridges and buttresses of the Lakeland mountains; offering a fantastic sense of personal achievement amid panoramic views that few others have experienced. Scrambling by definition is the ascent of rock using both hands and feet, where the route is not considered difficult or sustained enough to warrant the term 'rock climbing.' The essence of scrambling is moving freely over rocky terrain, always exercising judgment in what can be tackled safely. During your course we will tutor you in the art of scrambling, covering all aspects from route selection, scrambling skills, modern rope handling techniques (including use of belays and 'moving together'), safe methods of descent, and abseiling. The majority of our courses are located within the Lake District, but between autumn and spring we also run courses on the Sun Rock of the Mediterranean (including Mallorca, Sardinia, Costa Blanca, Corsica). Other overseas destinations include Jordan's Wadi Rum and the Picos de Europa in Spain. We also offer weekend breaks to other top quality scrambling venues in the UK, including the Cuillin Ridge, Isle of Skye and North Wales. In the Lake District, favourite scrambles include Cam Crag Ridge, Pinnacle Ridge and Sharp Edge. In the case of the Cuillin Ridge, however, clients will require a reasonable degree of fitness and scrambling experience, as the trip involves at least two long days on the mountains. transport to and from the crags (but see specific courses and holidays for exclusions - e.g. airfares). Spectacular views and locations are the norm on our scrambling days. Photo © Go Higher. 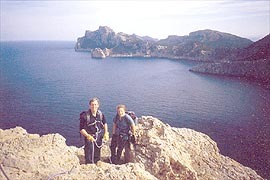 Scrambling in Mallorca, with stunning views over the Formentor Peninsula. Photo © Go Higher. 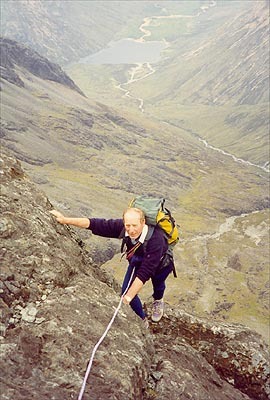 [Inset Photo]: Scrambling on High Stile, Lake District. Sca Fell is in the distance. Photo © Go Higher.